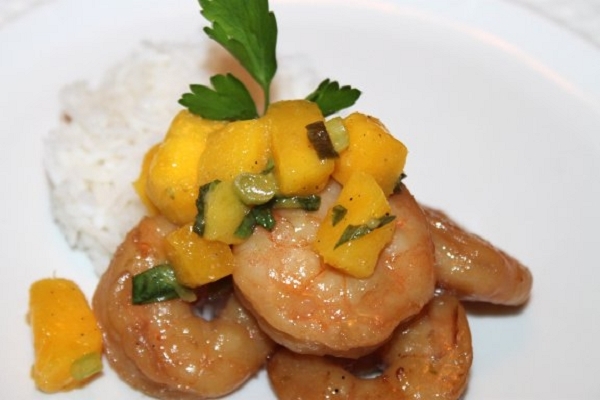 If you've never had mango salsa, your taste buds are in for a tantalizing treat. Mango salsa can be paired well with pretty much anything. Here it's paired with a delicious coconut shrimp. Shrimp (Size: 16/20), mangoes, scallions, basil, lime juice, jalapenos, garlic, brown sugar, soy sauce, coconut milk and spices. 1. Marinate shrimp at least 30 minutes prior to cooking but not more than 4 hours by adding the sauce to the bag of shrimp, mix and let sit in the refrigerator. 2. Once the shrimp marinates, heat a non-stick skillet over high heat. 3. Add shrimp to skillet, setting aside the sauce for later, and cook 2 minutes per side until pink, cooking in batches as needed (do not overcook). 4. Transfer cooked shrimp to a serving plate. 5. Add sauce to a sauce pan and boil 5 minutes until slightly thickened. Pour the sauce over the shrimp. 6. 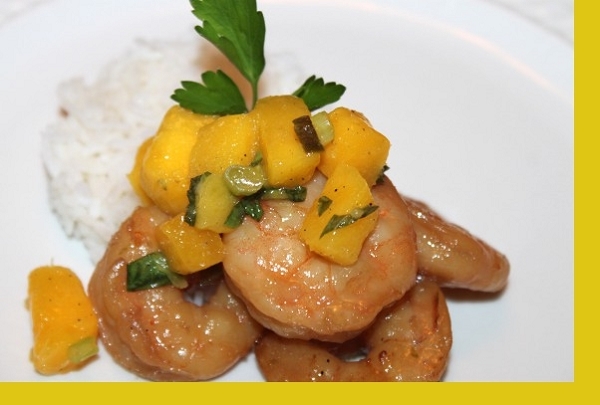 Microwave the rice until warm and serve together with shrimp and mango-basil salsa. Really enjoyed this dinner..just plain outstanding. Not your traditional coconut shrimp. The flavors were an unexpected pleasant surprise. We are repeat customers and this is by far a favorite! My husband and I are new customers. We have really enjoyed travelling the world cuisines through Maria's Gourmet Kitchen. The coconut shrimp was absolutely awesome! Restaurant quality dinner fixed in my home! We really enjoyed the shrimp. If was a restaurant quality dinner fixed in my home! A dinner I would be proud to serve to guests. Shrimp and marinade were very good and easy to fix. This is a great meal for shrimp lovers. Quick, easy and delicious!